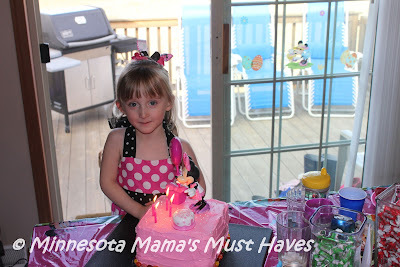 Minnie Mouse Birthday Party!! Danika is Now A Whopping 4 Years Old! I cannot believe that my oldest child, Danika, is now 4 years old! Time flies!!! This year she decided that she wanted a Minnie Mouse themed Birthday party. I was so excited as Minnie Mouse is a really fun theme to do! I just love planning my kids Birthday parties. I tend to go overboard and this year was no different. Since we have now moved to a bigger house we were able to host the party at our house this year rather than at a community center. The party was a blast and we had about 45 people at the party! That’s what you get when your husband comes from a big Italian family. Our Birthday parties are like a small wedding lol. A bit overwhelming perhaps to those that aren’t used to a huge family! 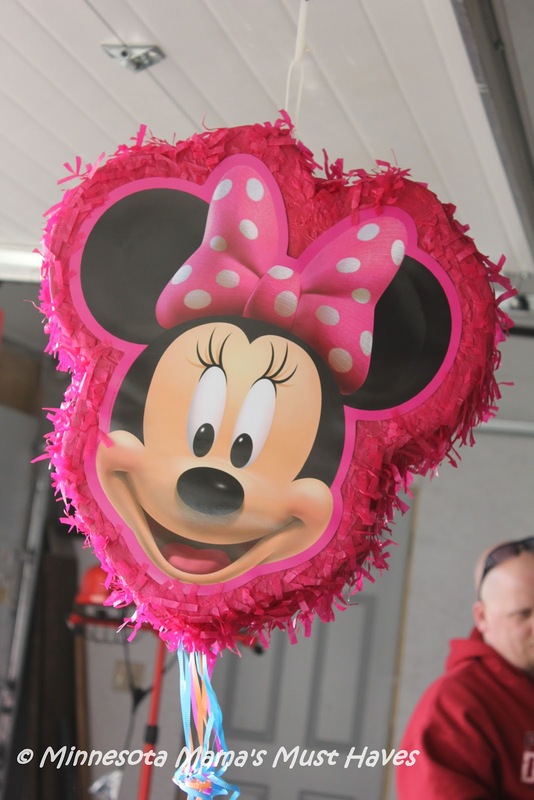 We got this adorable 54″ Disney Minnie Airwalker Jumbo Balloon which was a huge hit (no pun intended!). Isn’t she adorable? It was the perfect way to welcome our guests to the party! Each child had a chance to take their picture with her which was great! 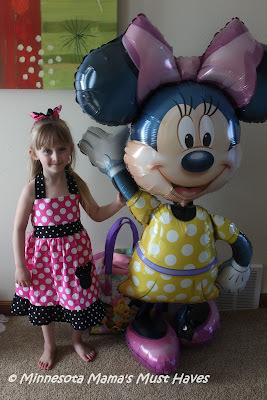 We purchased a helium tank to blow her up and we were able to blow her up along with all of the balloons that we received in our deluxe Minnie Mouse party kit from Birthday Express without running out of helium. She was easy to inflate and lasted forever! She is still hanging out in Danika’s room! There are little cardboard weights that attach to the bottom of her feet to keep her grounded. She is SO cool and I highly recommend having an air walker balloon at your next party. The kids loved her! 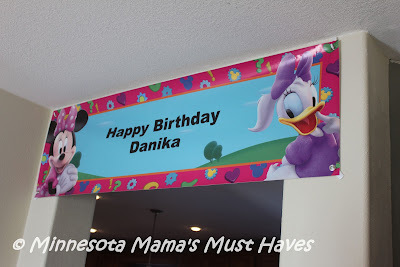 Also waiting to welcome our guests to the party was this huge personalized Birthday banner which also matched our Minnie Mouse theme! I have always ordered my personalized Birthday banners from Birthday Express and I have NEVER been disappointed with how they turn out. They are the nicest quality banners which are printed in high definition on heavy duty vinyl so they are durable enough to withstand serious kids-play and all types of weather. Banners also feature metal grommets for easy hanging indoors and out. We used Command hooks to attach ours to our wall without damaging the wall. It worked great! You would expect a high definition, quality banner like this to cost an arm and a leg but surprisingly prices range from $15.99-$39.99 depending on the size you choose. It’s a great value! I had a lot of fun decorating the table for Danika’s Minnie Mouse themed party. 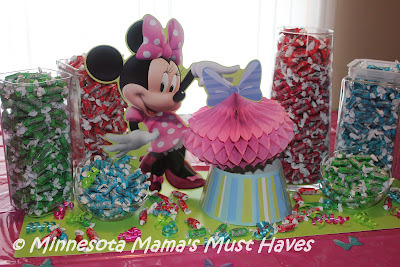 I used the Minnie Mouse tablecloth topped with one of the green placemats and the Minnie Mouse centerpiece (all included in the Deluxe party kit) and surrounded them with glass jars of various sizes filled with Tootie Frootie candies. It looked amazing! I then curled the pink, blue and green curling ribbon (included in the deluxe party kit) and cut small curls and spread them along the bottom with the candies sprinkled in. 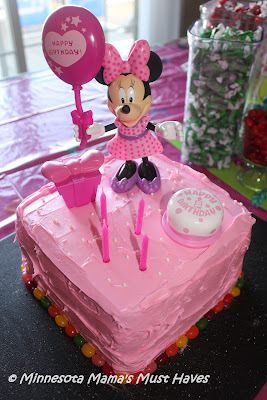 I made Danika this really easy Minnie Mouse Birthday cake too! Isn’t it cute? I used 4 of the hot pink candles included in the deluxe party kit as well. She loved her cake! 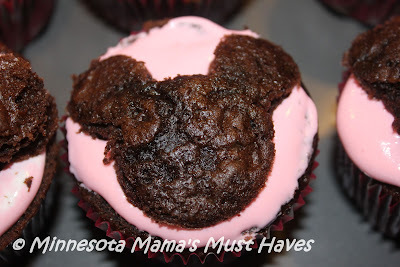 Since I just can’t help but give myself a million things to do, I also made Minnie cupcakes! Cute huh? More to come on those next week! Danika was excited to blow out her candles! I bought a Minnie Mouse dress on etsy for her and I made her a cute Minnie Mouse bow to match! Everything in her favorite color, pink! 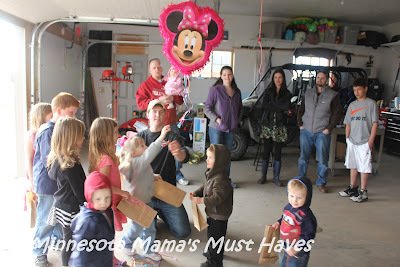 The thing that Danika was MOST excited for was the Minnie Mouse Pinata! 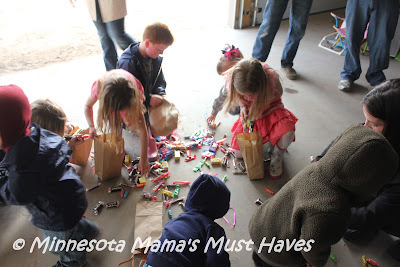 I love the pull string pinatas and if you haven’t given them a try yet then you should! They are perfect for little kids since there is no bat swinging involved! The kids simply pull the string, one at a time. Only one string will open the pinata and release the candy so the suspense is great. We lined up the kids and they each got to go through the line, some more than once until the right string was pulled! Our party was a huge hit with the kids and the adults! Everyone had a great time and I loved hosting it! Birthday Express has always been my go to party supply site and the only site I’ve used to supply my kids Birthday parties. Once again they helped me throw an over the top party for my daughter and they didn’t let me down! 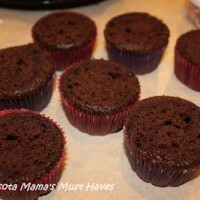 I highly recommend their products for your next party! Buy It! 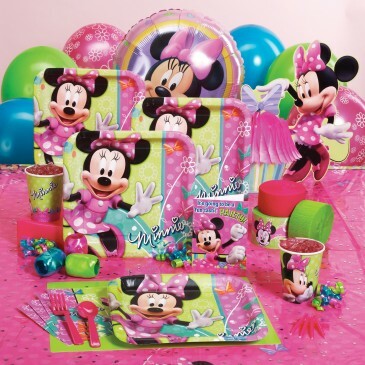 You can buy the Minnie Mouse decor seen here on the Birthday Express website! 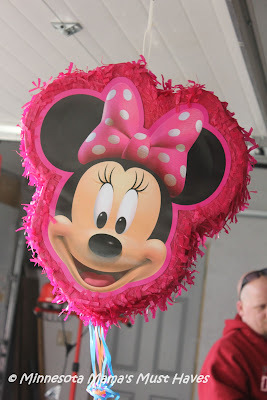 DIY Minnie Mouse Birthday Party Games! 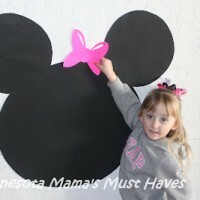 Pin The Bow on Minnie Mouse! Princess Party To Go! Review & Giveaway! So fun! How Do You Entertain A Bunch Of Little Girls At A Birthday Party??? I like the Lego Star Wars pack! My daughter would love the "Tea for You" pack. She wants to have a tea party for her 4th birthday. My twin sons want the Mario Bros one. Love it. My favorite is the Minnie Mouse or Micky Mouse Clubhouse for the 2 year old. The owl for the baby and the puppy dog for the nine year old. I love that they have Dr. Seuss themed party supplies, they are the only ones that carry Dr. Seuss party supplies. My favorite is the Dinosaur Train theme! I also love the fancy nancy set! I like the Lego City theme. Thanks for the chance to win! Love Birthday Express…I think our favorite currently is the Pink Poodle in Paris. Too many great themes to choose from. Sesame Street-Elmo is our favorite! My favorite theme is Yo Gabba Gabba. I would choose the Pirates Deluxe Party Pack! thank you! I like the Monster Jam pinata. My grandson would love the Disney Toy Story 3 3D Deluxe party pack! My favorite is the Lil' Princess 1st Birthday Deluxe Party. My fave is the Horse Power party theme. Thanks. My favorite theme is the Sweet Safari Blue 1st Birthday theme. I like the cat in the hat theme! My daughter would love the Angry Birds theme! I love the Pink Mod Monkey theme!! I love the Puff, the Magic Dragon theme!